To ask other readers questions about The Wealth of Nations, please sign up. What kind of wealth was meant in the Adam Smith,book?! For a truth, about 3/4 of this book is 18th century blabber about corn prices. Of the remaining 1/4, about 1/2 is criticism of mercantilsm, which is mostly obvious and definitely boring. "It is not from the benevolence of the butcher, the brewer, or the baker For a truth, about 3/4 of this book is 18th century blabber about corn prices. Of the remaining 1/4, about 1/2 is criticism of mercantilsm, which is mostly obvious and definitely boring. "He generally, indeed, neither intends to promote the public interest, nor knows how much he is promoting it...he intends only his own security; and by directing that industry in such a manner as its produce may be of the greatest value, he intends only his own gain, and he is in this, as in many other cases, led by an invisible hand to promote an end which was no part of his intention. Nor is it always the worse for the society that it was no part of it. By pursuing his own interest he frequently promotes that of society more effectually than when he really intends to promote it." A prideful and ambitious boy, hearing that President Kennedy had been a speed reader, I cut lawns and shovelled walks to pay for an Evelyn Wood Reading Dynamics program. We met in the spare basement of the hideous modern structure that passed for Park Ridge's "Inn"--a residence primarily for attendants and pilots from the airlines utilizing nearby O'Hare International Airport. I was a sophomore, the youngest in class, quite serious and full of myself. The Wood method consisted, basically, of two A prideful and ambitious boy, hearing that President Kennedy had been a speed reader, I cut lawns and shovelled walks to pay for an Evelyn Wood Reading Dynamics program. We met in the spare basement of the hideous modern structure that passed for Park Ridge's "Inn"--a residence primarily for attendants and pilots from the airlines utilizing nearby O'Hare International Airport. I was a sophomore, the youngest in class, quite serious and full of myself. The Wood method consisted, basically, of two parts. First, don't subvocalize while reading. Second, run a finger down the page while soft-focusing on the text. The rest was a matter of practice and ever-faster fingers until some of us were "reading" as fast as we could turn the pages. The texts for class were, one suspects, Ms. Wood's efforts to make the world a better place. They included Ayn Rand's Anthem, an early exercise, and Adam Smith's An Inquiry into the Nature and Causes of the Wealth of Nations, the final exercise. I was so expert by that time that the Wealth of Nations took no longer than Rand's novella had--thirty or forty minutes maybe. The whole business was a sham of course. What we were learning was how to skim and cram, skim and cram for examinations designed to pick up on the kinds of material one might retain from a skim and cram method. The rest depended upon what Marx termed "the labor theory of value"--we had spent a lot of money and time on this stuff, so it had better have paid off or we'd be fools. "The Wealth of Nations" is the book that changed greed to a virtue instead of a sin. In fact, greed is one of the Seven Deadly Sins in Christian theology. Greed is a sin in ALL the great religions, including Judaism, Islam, Hinduism, Zen Buddhism, Buddhism, American Indian Spiritualism, Wiccan nature love, Bahá'í Faith, Gnosticism · · Rastafari,Samaritanism, Indian Ayyavazhi, Jainism, Sikhism Iranian Ahl-e Haqq, Manichaeism, Mazdak, Yazidi,Zoroastrianism, East Asian Confucianism, Taoism,Recent C "The Wealth of Nations" is the book that changed greed to a virtue instead of a sin. Indo-European Celtic, Germanic Illyro-thracian, Greek (Gnosticism · Neoplatonism), Mithraism, Vedic Hinduism . . . .
All these religions say greed is wrong. All these religions say you should not gather wealth at the expense of your neighbors. But this man Adam Smith says it is OK to do whatever is necessary to obtain wealth. Adam Smith says it is a good thing to allow your instinct toward selfishness to rule your life. He calls it Capitalism. And it works for a century or so before the robbed and disenfranchised revolt and kill off the greedy ones who rule society to their benefit. Greed is the basis and essence of Capitalism, especially US Capitalism, in which every individual is guaranteed the "right to pursue happiness". Has anyone EVER questioned that? Why is more important to be happy than to know where you fit into the Grand Scheme? Why is more important to make money than to find and free your spirit? Look at any wealthy person who gained his or her wealth through competiton -do they have a healthy or unhealthy spirit? In turning greed to virtue, Adam Smith has created an economic system that more accurately has been called "Social Darwinism". In other words, according to Smith, it is perfectly natural for the meanest, strongest, most clever individuals to gobble up so much capital that the great majority of people are left with crumbs. The weakest of us "deserve" to be poor, according to Smith. The Bible and every civilized religion in the world disagree, saying greed is a sin because the individual chooses to be greedy even though he/she knows it will cause great shortages of money among the meek and powerless. Capitalism therefore is a sin, not an acceptable economic system. So long as there exists a middle class nothing catastrophic should happen to the society embracing this sin. But right now the middleclass is disappearing in the USA (as it has in all empires), leaving only the few monsters at the top and everyone else in poverty. Forgive me for reading and for using my mind to agree or disagree with the author. I know most of you are capitalist because you are citizens of the USA. I am frankly a disciple of Diogenes and believe we should all be free and enjoy life -- there is plenty to go around without getting into a harness and working yourself to death. Let's face it, communism would have worked if they'd killed off the hogs as they rose to power. There are always hogs in society -- it is the duty of society to keep them chained or jailed. Adam Smith, to a real Christian, is Satan personified. How devious and clever to claim a sin is a virtue. I recommend reading this admittedly fascinating book because it is an explanation of why Rome, Great Britian, the Ottoman Empire, et al, in the end collapsed because of greed made a virtue. Adam Smith eloquently and wittily pretends to be a friend to the common person. So does "Das Kapital" and "Mein Kampf". I personally am not a communist, socialist nor capitalist. I'm absolutely a nobody and you can take that to your corrupt bank. I revel in the freedom of my mind! I am an old graybeard and have read a thousand books --I was cast out of the 20th Century for chastising lesser minds, indifferent minds. I have been driven mad -- but in that madness there has come a clarity. It is so bright and wonderful that I can see clearly what I could not see before. For some reason, the American Right tend to be as vehemently in favor of the Invisible Hand of the market as they are vehemently against the Invisible Hand of Darwinian selection. And the old USSR was exactly the same, except that they reversed the two positions. Am I the only person who thinks this is just plain weird? How can one go through life without reading the Wealth of Nations? Adam Smith had the idea of modern economics before the United States was even sovereign (I go not so much for good writers, as I do for innovative and groundbreaking thinkers). Imagine coming up with your own idea of an economic system long before the world was ready. And unlike Marx, may I mention, Smith's ideals are not only flourishing and still seen today, but they are the foundation of the many, many economies and nations. Always a great classic on economics. His one fatal flaw was opening the door for Marx. By placing value based on labor, laborers feel they are the ones that deserve all the reward. Labor means nothing if no one wants the item being produced. The free market drives price, not the amount of labor put into a product. Great chance to see and understand how economics developed. An erudite who not only changed the shape of economics thinking but also laid the foundation of capitalism and industrialization. The book by him can be regarded as The Bible of economics. Adam Smith’s “An Inquiry Into The Nature And Causes Of The Wealth Of Nations” (often called simply “The Wealth Of Nations”) is one of two great works from the Scottish economist and philosopher, the other being the lesser known “The Theory of Moral Sentiments”. “The Wealth Of Nations” was published on March 9th, of 1776, but there were additional editions in 1778, 1784, 1786, and 1789. I read the free Kindle version of “The Wealth Of Nations”, and while I do not recommend that version I do recom Adam Smith’s “An Inquiry Into The Nature And Causes Of The Wealth Of Nations” (often called simply “The Wealth Of Nations”) is one of two great works from the Scottish economist and philosopher, the other being the lesser known “The Theory of Moral Sentiments”. “The Wealth Of Nations” was published on March 9th, of 1776, but there were additional editions in 1778, 1784, 1786, and 1789. I read the free Kindle version of “The Wealth Of Nations”, and while I do not recommend that version I do recommend the overall work. The issues with the Kindle version are that it is poorly formatted, and it is painful to attempt to read the numbers in the tables at the of Book I. You are much better off getting a hard copy so that you can more easily flip to the section of interest, and to read the information in a better format. As for the rest, the content is all there, once you get past the poor formatting. The work contains five books within. The first is “Of the Causes of Improvement in the productive Powers of Labour”. In this book he discusses the benefits of the division of labor, the origin and benefits of using money, a section on the “real” price of commodities (i.e. how much toil it takes to produce them), a discussion of the natural and market prices of commodities (the forces of supply and demand), the effect of controlling a commodity can have on the price, the wages of labor (again a case of supply and demand with the commodity of labor), the profits of stock, a discussion of the ill effects of groups who use their influence to manipulate the government (this would include banking conglomerations, trade unions, etc. ), and closes with a section on rent. The second book is “Of the Nature, Accumulation, and Employment of Stock” which deals with accumulating wealth which lasts a longer period of time. This book starts with how one divides their stock into what they need for personal use, and what they can dispose of in exchange for others available stock. He then moves into a discussion of money as a type of stock, and then how to use their excess money/stock to gain interest. The third book is “Of the different Progress of Opulence in different Nations”, where he talks about the balance between the inhabitants of towns and those of the country areas and goes into how agriculture is discouraged over time, while cities and towns prosper. The fifth book is “Of the Revenue of the Sovereign or Commonwealth” in which Smith deals with taxation. This is an important area to read and understand, as it is the one which many ignore when using Smith to try to support other areas. There are hints here of the progressive tax, as well as a discussion of the expenses of the nation, an important acknowledgement that the poor spend the greater part of their income on the fundamentals, such as food, and so he suggests luxury taxes as not unreasonable. Smith then closes the final book with a discussion of the costs of war, both for the actual fighting, and in terms of the loss of trade. This is a pillar of western civilization but not much fun so don’t read it unless you have to. A Wiki should give you more information than you need to know. The 7 hour abridged Audible edition gave me more far more info than I needed or wanted. Thank God that’s over. رأى سميث أن الوصول إلى الثروة هوالغاية الأساسية للاقتصاد، وكان للمواضيع التي تطرق إليها (العمل، القيمة، الريع، السعر، التوزيع..) أثر بالغ في تنظيم علم الاقتصاد السياسي. اعتبر سميث أن ثروة كل أمة تقاس بقدرتها الإنتاجية، وتناول الإنتاجية كمقياس للثروة التي يمكن مضاعفتها بتقسيم العمل. واهتم بطرق توزيع الثروة في المجتمع ووسائل تنظيم التجارة وتقسيم العمل، إضافة إلى أطروحاته المتعلقة بحرية السوق واليد الخفية التي تساهم في دفع الحركة الاقتصادية وتشجيع الاستثمار، ودعوته إلى الحد من تدخل الدولة المباشر في رأى سميث أن الوصول إلى الثروة هوالغاية الأساسية للاقتصاد، وكان للمواضيع التي تطرق إليها (العمل، القيمة، الريع، السعر، التوزيع..) أثر بالغ في تنظيم علم الاقتصاد السياسي. 1. Smith, in various places in the book, criticizes merchantilists and others. However, since the average reader (even the average economist) has no knowledge of merchantilists and physiocrats, all his comments SEEM correct, whereas in fact they are just simplistic and unfair (merchantilists never confused wealth and money, and physiocrats invented many important concepts in economics and public finance). So, lots of great economics books (think of John Steuart or Sir William Petty) were simply ignored. 2. Smith never quoted another writer. It is because he invented economics by himself? No... it is because he never bothered to give references, "forgot" to mention what he took from other great writers, especially the physiocracts. Thus, the book gives a false impression that he is MUCH more original than he actually is. 3. He did not invent free markets, market economy, or economics. Period. He is not a liberal, or even a liberal economist. Yet, he is claimed to be the founder of economics (labelled "classical" economics). Considering that there were economists before him, what makes him the father of anything? Simple answer: because economists do not read historically important works in economics, they just quote Smith. (I could just go on and on, but there is no need to). Let me simply say that if you want to get informed about the history of economics, start with the merchantilists. If you want to learn about modern economics , the true founding father of modern economics is Jeremy Bentham. He is the true inventor of homo economicus. A text that's still relevant (and its main points still taught). The Wealth of Nations is far from a short read, but I feel like it's main points are pretty easy to sum up and since when they have been put into practice we have seen the results intended, it has maintained its importance. Basically it states that producers are better off investing in capital and labor (creating a division of labor) so each laborer only has to specialize in one task, thus creating a far more efficient output. Ultim A text that's still relevant (and its main points still taught). The Wealth of Nations is far from a short read, but I feel like it's main points are pretty easy to sum up and since when they have been put into practice we have seen the results intended, it has maintained its importance. Basically it states that producers are better off investing in capital and labor (creating a division of labor) so each laborer only has to specialize in one task, thus creating a far more efficient output. Ultimately specialization doesn't only increase speed and surplus (which can be traded for goods or exchanged for currency) but it also leads to further innovation, because the more familiar a person is with a task the easier it will be for them to find a way around it. Next, self interest serves the economy as a whole, because the famous invisible hand will guide competitors to create higher quality products and offer better customer service because it's in their best interest. Avoiding these tasks or taking shortcuts will hurt them. The market is more efficient than the government so the role of government should be limited to defense, infrastructure and education. Basically made it sound like the more centralized the decision are, the more harmful they can be towards the growth of the economy. 4.0 stars. I read this on my own in law school. I know, I know, who does that right? Well I obtained this as part of my Easton Press colleciton of "Books That Changed the World." I remember being really intrigued by the book and it made me more interested in the history of economics. This book was absolutely a pain to get through. Maybe the biggest difference between 2012 and 1776 is that people have less patience. This economic book, seems to have made a huge influence on future economists and capitalists, but reading over 1000 pages on extremely dry economics was really difficult for me. There are some good ideas in the book, but reading pages after pages of grain prices was not something I could easily handle. I’d have left the book unfinished, if it was not my resolve (or OCD, whichever way you want to look at it) that has me finish every book I read. The book itself is interesting in that it really does seem to have influenced current modern western economics, or maybe, it hasn’t really influenced it as much as foretold it. To the western world, for a while now, emotions and spirituality has been cast aside, and in its place have been rationality, and by extension, capitalism. In this book, Adam Smith talks a lot about society, governments, people, and slavery, but it is never about morality, and always about the progress of the materialistic world. I’m not criticizing the work, because relying on logic sometimes makes sense. For example, Adam Smith is against slavery in the book, not for its ethical reason, but the fact that he believes that freeman are better workers than slaves, therefore a nation can progress faster if it pays wages to its laborers, rather than having slaves. That is, in the long term, having no slaves is materialistically advantageous. "The desire of food is limited in every man by the narrow capacity of the human stomach; but the desire of the conveniences and ornaments of building, dress, equipage and household furniture, seems to have no limit or certain boundary." It is a good book to have read, but it might have been better for me to read an abridged version, 200 or 300 pages would have been better for me to absorb the main concepts and reflect on them, rather than have the ideas repeated, stretched, and given dozens of pages of examples about freaking grain prises. Three things happened in 1776. 1. The Revolutionary war started (Declaration of Independence). 3. 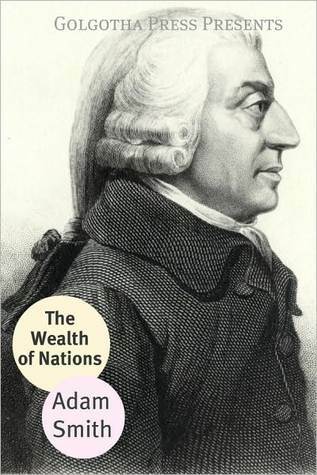 Adam Smith published "The Wealth of Nations". کتاب پر از تاریخ و عدد است و خیلی کند جلو می رود، خیلی سنگین است و مثل دایره المعارف است. اسمیت می گوید بازتاب زیبایی بازار این است که خود حافظ خود است و بازار که اوج آزادی اقتصادی فرد است، سخت گیرترین تمام کارفرماهاست. We know from experience that Smith's system is not complete unto itself. In fact, Smith himself would probably have admitted this. His references to ancient history and political philosophy would seem to show not only that he accepted that the territory of "statecraft" is not entirely contained within the borders of classical economics but also that he accepted the State's place alongside the Market as a fundamental, primordial feature of social existence. That much being said, Smith deserves cre We know from experience that Smith's system is not complete unto itself. In fact, Smith himself would probably have admitted this. His references to ancient history and political philosophy would seem to show not only that he accepted that the territory of "statecraft" is not entirely contained within the borders of classical economics but also that he accepted the State's place alongside the Market as a fundamental, primordial feature of social existence. That much being said, Smith deserves credit for several revolutionary discoveries. Most importantly, his emphasis on the control and cultivation of markets -- and not territory [as the physiocrats claimed:] or gold [as the mercantilists claimed:] -- as the proper objective of macroeconomic policy ranks as a major breakthrough. His use of market-analysis to explain the collapse of the Spanish colonization of the New World and the success of the Enlgish is a powerful, and clearly true, demonstration of the fundamental effectiveness of his model, even if subsequent events have shown that cases do exist in which market considerations should not be the primary ones in the decision making process. His elucidation of the labor theory of value as the foundation of a real price of a commodity is both accessible and convincing, and it is a considerable advance beyond the original iteration of the theory by Locke. His distinction between the real price and the market price of a commodity raises the question of the role that the market should play in determining prices, and that, again, remains one of the most important questions in the history of political thought. Like most applications of the Doctrine of a Self-Correcting Market, Smith's faith in the tendency of the market price of commodities to remain, over time, faithful to the real price has to be viewed as more of an ideal than a reality. But his description of the law of supply and demand as a means of calculating market price from the underlying real price seems irrefutable. A long time to read, but providing interesting perspective. Adam Smith is called the Father of Modern Economics. After reading his book, considered his magnum opus (great work), I have the following thought to share. Smith discusses three types of people; those who make money by rent, by labor, and by employment of stock. With respect to the various laws each of these group tends to propose, he considers the likely merits. Those who make money by rent can only make money if the people who supply A long time to read, but providing interesting perspective. Adam Smith is called the Father of Modern Economics. After reading his book, considered his magnum opus (great work), I have the following thought to share. Smith discusses three types of people; those who make money by rent, by labor, and by employment of stock. With respect to the various laws each of these group tends to propose, he considers the likely merits. Those who make money by rent can only make money if the people who supply that rent are doing well. The laws they suggest should be good for the society. Those who make money by labor need both those who make money by rent and those who make money by the employment of stock to do well if they are to succeed. (They require a place to live and a place to work, as it were, and cannot harm either overmuch without harming themselves.) The third category of people he discusses is different. People who make money by the employment of stock are frequently accused of suggesting laws that do not suit the other two groups. Keeping in mind this book was published in 1776, the same year the US was founded, and that it is written in the language of the time, this is a thorough examination of how patterns of trade, currency, and growth occur. The foundation upon which all other economics books are written. Stick this book in your bathroom and read one of the short little 12-page chapters every time you pay an extended visit. At over 1000 pages, it will take a while, but if you want to teach yourself how to debunk the f Keeping in mind this book was published in 1776, the same year the US was founded, and that it is written in the language of the time, this is a thorough examination of how patterns of trade, currency, and growth occur. The foundation upon which all other economics books are written. Stick this book in your bathroom and read one of the short little 12-page chapters every time you pay an extended visit. At over 1000 pages, it will take a while, but if you want to teach yourself how to debunk the free trade B.S. people misattribute to Adam Smith and skewer your obnoxious MBA brother-in-law at the next family gathering, read Adam Smith for yourself. He doesn't say what the US Chamber of Commerce -says- he says. This book was far too long. Too much talk of corn prices and criticism of mercantilism. But once you get to the parts regarding Smith's idea of free markets, unregulated by the state, things get interesting. Having lived through an economic crisis, I was hesitant to give this book a try, but I'm glad I did it. It's good to see how 18th century people though free markets would work (back then no one had even heard of corporations and businesses belonged to specific people). Compared with what came This book was far too long. Too much talk of corn prices and criticism of mercantilism. But once you get to the parts regarding Smith's idea of free markets, unregulated by the state, things get interesting. The most influential book of all time. Every commodity and service we enjoy - from transportation to technology to cheaper metal production - has come because of those who have stood on the giant shoulders of Adam Smith. The natural processes of a successful economy are found in Adam Smith’s Wealth of Nations. Although two hundred plus years old, Smith focuses on significantly profound and pertinent principles for any age. Stressing that regulations tend to limit prosperity and production, his extensive research of history and economics proves that a free market is an effective system in producing a wealthy nation. “The object of political economy of every country is to increase the riches and power of the country,” writes Smith. He proposes that wealth is built on labor, savings and investment. His labor theory of value regards “labor [as the:] the real measure of the exchangeable value of all commodities [and that:] the real price of everything is the toil and trouble of acquiring it.” Unlike our nation’s current course of consuming, Smith declares that saving is the sure path to wealth. He observes that, “Parsimony, and not industry is the immediate cause of the increase of capital.” Importantly, he measures the wealthiest nations as those who have a surplus to invest or to increase production. His main theme throughout is that great fortunes are made through a long life of industry, frugality, and careful saving. Lamentably our country is in financial trouble. The future looks bleak as we contemplate the consequences of consumer and national debt, deflation of currency and an increase of government intervention and regulations. A close look at society will reveal that individuals as a majority are heavily in debt. What is the solution to this downward financial spiral? Do our societal choices mimic individual choices? God, as a standard of what is right and wrong sets moral principles for promoting human happiness and progress. When those principles are followed, happiness and progress abounds. But the opposite is true that misery and decline follow when wrong choices are made. For example, a prodigal, who does not live within his means, destroys his capital and that of others. His idleness and prodigality encroaches upon the industry and capital of his progenitors. If a great number in a society follow his immoral example then society is in a state of debt and moral decline. Adam Smith states in his book, Wealth of Nations, that if prodigality is not compensated by frugality the path will lead to an impoverished country. Individuals must change if the society is to change. Change must come from the bottom up. Supposing that Adam Smith is correct, I propose that the solution to our economic woes begin with individuals who are hard working and frugal, who save for a rainy day and who invest surplus income. Individually achieving these four principles will have a great affect in improving our nation’s economy. Smith affirms, “As capital of an individual can be increased only by what he saves from his annual revenue or his annual gains, so the capital for a society, which is the same with that of all the individuals who compose it, can be increased only in the same manner.” Sorry John Maynard Keynes, your philosophy of spending, debt and deflation of money has historically proven to send a nation to its ruin. Smith explains that the principle of saving regularly is a natural expression of bettering oneself and that the greater the fortune, the greater ability to improve individual, familial and societal conditions provided that the individual is a moral person. “Capitals are increased by parsimony, and diminished by prodigality and misconduct,” writes Smith. Wealth is not built upon spending and consuming, but upon sound principles of careful investing, saving, frugality and parsimoniously living. If Smith’s principles are practiced, the nation’s downward spiral can be reversed. Recommends it for: Anyone living in the 21st century. The Wealth of Nations is an excellent work of the 18th Century enlightenment. It examines in a logical way that can be understood by any reader how government actions in commerce canharm the public interest. For example if price controls are instituted because food costs too much in a city, supply will diminish radically as producers will take their crops to a different city. If a trading company (e.g. British India company) is given a monopoly over the trade from East Asia, then the price of tea The Wealth of Nations is an excellent work of the 18th Century enlightenment. It examines in a logical way that can be understood by any reader how government actions in commerce canharm the public interest. For example if price controls are instituted because food costs too much in a city, supply will diminish radically as producers will take their crops to a different city. If a trading company (e.g. British India company) is given a monopoly over the trade from East Asia, then the price of tea will be higher in England than if Dutch merchants were allowed to import their tea. Hence this book is of great value in providing an early critique of government efforts to regulate commerce. The British East India company had received its charter because it had been felt that without the monopoly the company would lack the critical mass needed to assume the cost of defending its territory militarily. Unfortunately the British consumer had to pay a higher price for Indian tea and opium because of the monopoly. Read this book then. It is sensible and provides an excellent view into the debate amongst intellectuals and politicians in the 18th century. Smith is not considered to be an Economist. Economics as we now know it began with John Maynard Keynes in the 1930s. Keynes assigned the major components of the commercial and goods producing activities in our world to various accounts. He then proposed a model of goods and investment flow from one account to another. Using this model, governments could manage the level of growth and employment. What you or your friends studied in economics was really a methodology for managing a monetary flow that assumed the validity of a certain model. Whenever behaviour does not conform to the model, economists say that the model requires further refinement. Economics is not total hogwash however. When great care is taken to construct a market according to Keynesian economic theory, the model works brilliantly. Our financial and commodities markets are constructed and regulated so that the Keynesian model will operate with maximum efficiently. The result is that our international equity and commodity markets operate at lightning speed with extremely low transaction costs. The important thing is to remember that Smith has nothing to do with modern economics. It proposes no model that can be managed and is based entirely on common sense. It is great reading. Anyone interested in Western culture and civilization should read it. Much of what the book says confirms what any Economics 101 course would tell you - when you try to modify a free market, there are ripple effects. Take mercantilism again, as an example. Countries at the time tried to have "positive balances of trade", through methods such as prohibiting the exportation of gold, and encouraging exportation of everything else. This supposedly makes a country richer. In reality, all it does is make gold worth *less* in that country, because there are less products to buy per unit of gold available. This also leads to smuggling, where gold is sold to other countries where it is worth more. What would Smith think about the 21st century? I think he would be disappointed in our politics, both Democrat and Republican. Both Bush and Obama have overseen increases in the size of the federal government. Smith would likely be a conservative, but not a Republican or a "Tea Party" protester. He probably would've voted for Ron Paul in the 2008 primaries and Bob Barr in the general elections, despite flaws in both candidates. He would be against the War on Drugs, the bailouts, and probably the wars in Afghanistan and Iraq. He would be just as worried about corporate monopolies as he would government monopolies. I'm not so sure what he would think about healthcare - there are definitely problems with American healthcare, but don't think he'd want a public option or insurance mandate as a reform.